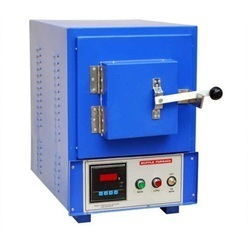 Our range of products include muffle furnace. We manufacture a wide range of Laboratory Muffle Furnace, which are known for their best efficiency power and the durability they possess. These furnaces have a big heating space, which is very useful. Further, these muffle furnaces use open coil heating elements on both sides of the heating chamber to allow fast heating with minimal temperature gradient, thus enabling them to perform better. Looking for Muffle Furnace ?